Big Pine Key (see map above) is the largest and most developed of the Lower Keys. The Lower Keys area as a whole is, however, the least developed area of the Keys. 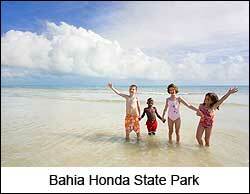 Peacefulness is the attraction for many who live and visit the Lower Keys. There are many small islands in the Lower Keys area. If you look at a map, the area is comprised mainly of a string of islands, except in the Big Pine area where it flares out into a multitude of Keys. The most significant Keys in this area are, from north to south, Bahia Honda, Big Pine, the Torch Keys, Summerland Key, Cudjoe Key, Sugarloaf Key, the Saddlebunch Keys, and Big Coppit Key. Arriving from the north, Bahia Honda State Park (MM 37) offers extensive beaches, as well as deep water close to the shoreline, making it excellent for snorkeling and swimming. Daily trips are also available to Looe Key National Marine Sanctuary (MM 27.5). Looe Key, named after the H.M.S. Looe, which sank there in 1744, also offers excellent diving. The Big Pine Area (a.k.a. the Lower Keys area) is a good place to look for the unique Key Deer, which only grow to be about 2 1/2 feet tall (75 cm). The Key Deer is an endangered deer that lives only in the Florida Keys. It is a subspecies of the White-tailed Deer. Living in close proximity to humans, the Key Deer has little of the natural fear of humans shown by most mainland deer. These deer are often found in residents' yards and along roadsides where tasty plants and flowers grow. This often results in car-deer collisions, as the deer are more active (and harder to avoid) at night. It is not unusual to see them at dusk and dawn. 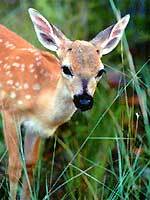 Contact the National Key Deer Refuge for more information on Key Deer.